Regency Cab of Gaithersburg is joining other businesses in using and promoting alternative fuel, to cut costs and help the environment at the same time. Regency, the second largest taxi fleet in Montgomery County, has placed into service what it says are the county's first flex-fuel taxi vehicles and is cutting back on the number of 8-cylinder vehicles in its 146-cab fleet. "We are taking the environmentally responsible step of introducing flex-fuel taxis and cars with smaller engines," said David Mohebbi, president of Regency Cab, in a statement. "That means that Regency drivers will help reduce air pollution and lower gas consumption." Montgomery County Executive Isiah Leggett (D) said in a statement, "Regency is leading by example. I hope more companies follow Regency's lead in cutting our dependence on foreign oil and fuel consumption." Last month, Regency was awarded 25 new taxi licenses by Montgomery County in a competitive selection process. Mohebbi decided that the company would purchase five Chevrolet Impala flex-fuel cars that run on biofuel, E-85. The vehicles are generally more expensive than conventional gasoline-powered cars, but the ethanol blend is generally cheaper than regular gasoline. Montgomery County Executive Isiah Leggett (D) said in a statement, "Regency is leading by example. I hope more companies follow Regency's lead in cutting our dependence on foreign oil and fuel consumption. Biofuel must contain at least 85 percent renewable ingredients to qualify for the designation. Mohebbi said that, in addition to the environmental benefits, his drivers also will benefit from the switch. "These new cars will allow my drivers to spend less money on fuel," he said. He also said that Regency is further reducing its gas consumption by replacing its aging 8-cylinder models with 6-cylinder cars and that this change will reduce gas consumption and pollution by 25 percent. 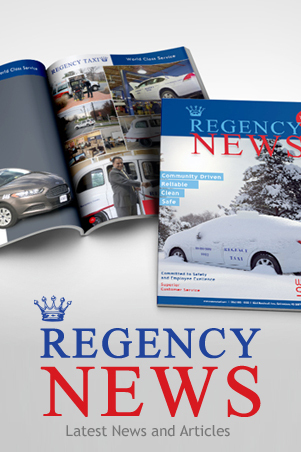 Please enjoy Regency’s winter 2014 magazine.